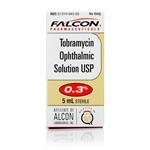 Tobramycin Ophthalmic Solution is an antibiotic used to treat eye infections in dogs and cats. This topical solution is applied around the eyes to prevent germs and bacterial or viral infections. 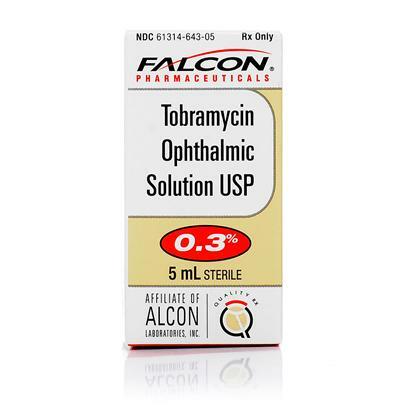 Tobramycin Ophthalic Solution is an ophthalmic antibiotic used in veterinary medication in the treatment of bacterial infections affecting eyes. The medication belongs to aminoglycosides class of drugs. In certain other cases the medication also finds use in controlling bacteria caused by respiratory infections, bite wound or injury-borne infections, and also those affecting the skin and ear of animals. Tobramycin, the active ingredient used in the medication possesses active antibiotic properties, which when administered restricts bacterial growth by delaying the protein synthesis. Though the drug is not approved for use in animals, most veterinarians have agreed to use the medication on dogs. However, tobramycin is a prescription drug and is available in various ophthalmic preparations as injectable solution, suspension as well as ointment. Animals with known reactions to the drug must not be treated with the medication. Do not use the medication in dehydrated animals as well as in those suffering from inner organ complications. Prolonged use of medication can cause damage to kidney in certain animals. Tobramycin has a tendency to react with certain combination of medications. Above all, it is important to strictly follow the prescribed dosage, as medication overdose can paralyze the animal. Use the medication only by prior consent from a veterinarian. The usual suggested dosage of the medication is 1 mg/lbs in a gap of 8 hours. The dosage administration can be by intravenous, intramuscular or subcutaneous. Aminoglycosides, the class of drugs tobramycin belongs to is always with its share of side effects. 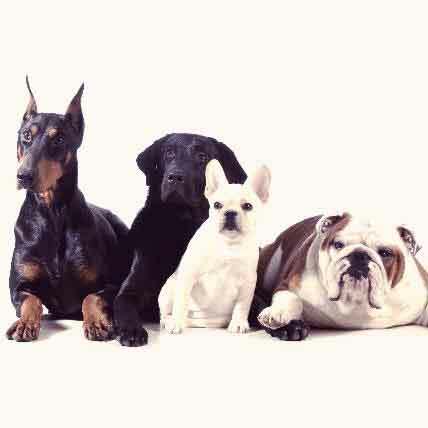 Drugs falling under this category are ototoxic to animals that can impair hearing or cause loss of balance in animals. 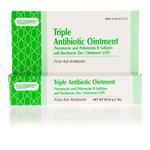 The medication can cause the usual reddening and irritation in animals. Kidney dysfunction is another side effect seen in certain animals using the medication for a prolonged period. 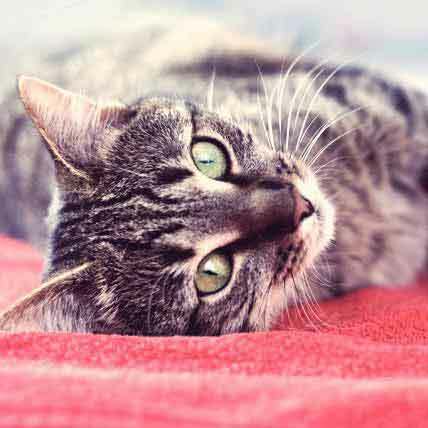 There are many effective options for treating ear mites, but it's imperative that you and your furry buddy see a vet so they can help you start the right treatment. 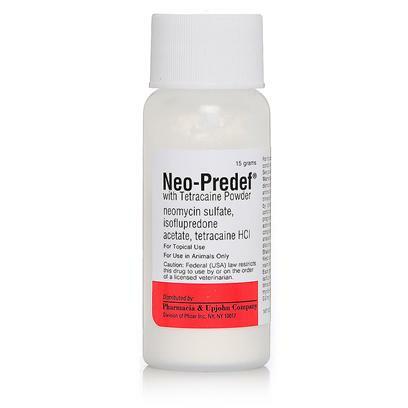 Neo-Predef with Tetracaine Powder is a potent combination for pet itch relief: neomycin sulfate, an antibiotic, isoflupredone acetate, an anti-inflammatory agent, and the topical anesthetic used to treat ear and skin conditions in dogs, cats, and even horses. 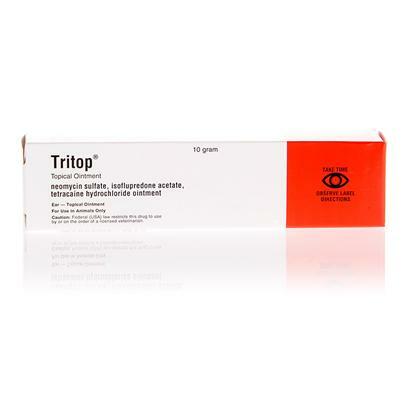 TriTop is a triple action topical anesthetic ointment combined with anti-inflammatory and antibiotic properties, used to treat skin and ear bacterial infections such as acute otitis externa in pets. Contains neomycin sulfate, isoflupredone acetate, and tetracaine hydrochloride.